Why do we ever fight? I may say some hurtful things in the heat of the moment, usually when standing on a scale, but I always come back, don’t I? You know I can’t stay mad at you. Totino’s Party Pizza, you are the greatest of economy meals. I’ve found you in Wal-Mart’s freezer section for as little as $0.99–a delicious, cheesy, crisp crust pizza for only a dollar and ready in ten minutes. I may occasionally flirt with Top Ramen or cereal, but you know I always come back. You forgave me for my brief fling with Tony’s Original Crust Four Cheese Pizza. When I got my first job out of college, I guess I wanted to prove to the world I was a high-rolling success and could splurge on a $2.99 frozen pizza, but our chemistry just wasn’t the same. 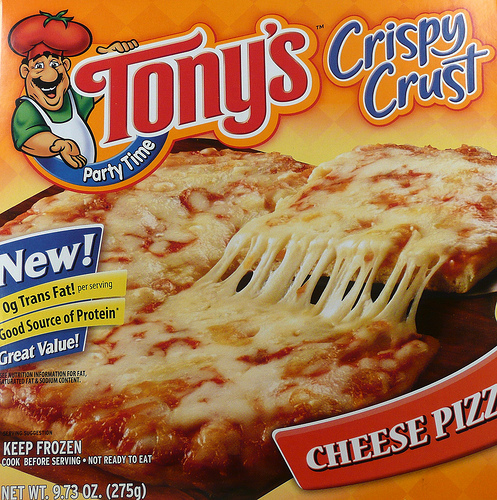 Every night with Tony’s Original Crust Four Cheese Pizza, I found myself thinking of you and remembering how many times it had been just the two of us on a Friday night, sharing a romantic $0.99 dinner. We’ve had our rough spots. 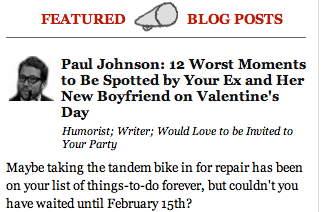 You always suspected my wife was scheming to keep us apart, and now I’m ready to admit your suspicions had some merit. When my wife was ready to give birth to our second son and she asked me to take her to the hospital, she appeared very calm, so I asked if I had time to eat something first because I had just returned from work and knew I wouldn’t get to eat for what might be a dozen hours until delivery. I popped you in the oven, Totino’s Party Pizza, and when I was done eating thirty minutes later, I took my wife to the hospital where she gave birth within twenty-five minutes of arrival and too late for her to receive an epidural. Of course I wouldn’t have waited so long if I had known she was so close to delivery, and I also wouldn’t have paused so long in the lobby to point out to her a funny part of The Simpsons episode playing on the waiting room TV, but I can’t accept all of the blame. I blame her for that hypno-birthing technique she insisted upon that made everything she said seem so preternaturally calm like she was on tranquilizers and made her request to go to the hospital sound optional. This “misunderstanding” is why my wife stopped buying you for a year, and bristled when I mentioned your name, and why I could only spend time with you while my wife was out of town. Sometimes you have to turn a blind eye in a relationship and overlook faults, and that’s why it doesn’t matter to me that you aren’t made with 100% real cheese, although I don’t quite understand how cheese can be imitated. And I don’t listen to the warnings of the Food and Drug Administration when they say you contain four times the daily recommended limit of trans fat. This warning doesn’t bother me because I don’t understand what trans fat is, and I’ve made an effort to remain ignorant so I can keep pretending it might be good for me. I like to imagine “trans” is short for “transitional”, as though a high dose of trans fat will improve one’s ability to deal with difficult life transitions such as a move or a new job or a second child coming at the same time your wife is mad at you and won’t let you eat your favorite frozen pizza. I can’t find you here in Shanghai, but I think about you all the time. I recently saw you at an imported food store. My heart beat faster as I spotted your familiar red packaging across the room in the freezer section. Time seemed to slow down as I reached for you and felt those old sentimental feelings begin to surface as memories of bachelorhood, poverty, and the inability-to-cook all flashed through my mind in an instant, but I paused when I spotted your imported price tag of $6.00. I like you, Totino’s Party Pizza, but I only $0.99 like you. A $6.00 frozen pizza should be something you’re willing to take home to share with your mom. My wife is currently in the US, and when she asked if I wanted her to bring anything back, I told her I wanted twenty Totino’s pizzas. She reminded me that even if she could keep you cold on the flight, we wouldn’t have room in our freezer for more than three or four. I insisted we could buy a second refrigerator, but she argued this would increase the average cost of each pizza to about $40. Sorry, Totino’s Party Pizza. I like you, but I don’t $40 like you. The loss of a first love is always the hardest. Try to keep your mind off it as much as possible and remember that perhaps in the afterlife you will see each other once again. Thanks for your kind words. I’ve been trying to eat more cereal and Top Ramen, but they just can’t fill that void in my life. 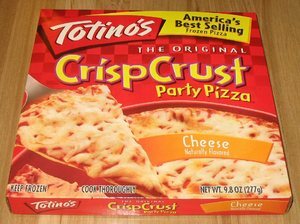 In my youth, I would appear at my friend’s doorstep just seconds before the ding of the oven, indicating the Totino’s pizza was cooked to perfection. After two months of my uncanny timing, the mother finally asked me to delay my arrival by an hour. If I had a friend whose mom made Totino’s every day, I would try and move in. I’ve been creeping with Jack for years. Hey, he’s more upscale at 3USD but a quality individual. http://tinyurl.com/3mmomua I only recommend him in he’s Mexican guise…nothing against his other get-ups, it’s just the sombrero does it for me. I’m not familiar with Jack’s. I wonder if they debuted after I moved abroad. I became aware of it maybe 10 years ago? God, I love those pizzas. Although I usually $2.97 love them because three makes a meal. What I wouldn’t give for a feast of three Totino’s in one sitting. Make sure you consider Totino’s as a possible dish to be served at your wedding. Ah yes, my husband and I spent many a night with Totino’s in our poverty years. I always knew if I could no longer afford Totino’s, then I really was in trouble. ah partially hydrogenated oils, trans fats and cheese-like product. My love/lust comes in the form of Totinos Pizza Rolls. I even ate them for lunch on my wedding day (I only bloated a little bit in my dress). Yummy! I hope you can find the Shanghai equivalent of a 99 cent Totinos. And if it didn’t cost so much damn money, I would send you one on dry ice overnight, but I don’t like you that much. If it was 99 cents, I would have. How could I have never tried the Totino’s Pizza Rolls? I share your pain. Nine years ago I moved 700 km from a city where the default cake icing is butter creme. I haven’t found it anywhere here… ever! Here they use whipped cream based icings, even on birthday cakes, the heathens. I don’t think this is a regional thing. It’s a movement that is spreading across the planet. The creeping infiltration of that whipped stuff (I won’t dignify it by calling it cream) on birthday cake is, to me, evidence of the decay of civilization. Good God I hope not. Or at least may Montreal be the last bastion of butter cream and will be able to hold out until I go to the Great Patisserie in the Sky! Okay, I’m going to admit it… I’ve never had a Totino’s Party Pizza… shame on me! You would expect me to recommend you go and get one, but I worry you’ll be disappointed unless you’re very poor and have never had great food before. The cheese ones are the best. Hmmmm. And I have gotten them cheaper on sale at the Kroger. How can they be any cheaper than $0.99? What’s the cost for Totino’s if they can sell them so cheap? Personally I feel for Mama Celeste, till I found out the pizza was just to fund her aggressive “protection” racketeering. By then I was in too deep. It’s really sad to see you separated from your love like this. Not fair really. I keep thinking I’ll find something else to fill that void but it’s never happened. O! The longing you must feel! I am Fortu-Not to live in an area where the best real pizza in the world is made. And yet, I am both dairy and wheat intolerant 😦 It is pure torture. Your choice of foods leaves me to think we may be kindred spirits worlds apart. But instead of the frozen pizza variety, I prefer to start with a fresh pizza crust (preferably made with parmesan cheese) and then place fresh toppings on, and unlike your pizza with the cheese that is not quite 100% mine is the freshest 100% fromage that is lovingly hand-grated. But other than that we could have been pizza besties. On another note, your wife sounds pretty demanding. Everything seems it has to revolve around her and her needs. Hmmmm . . . she’s lucky to have you. She better hold on to you! Absence does make the heart grow fonder. And, in this case, probably makes your heart healthier, too. I feel your pain. My husband ate my lunch and watched a Perry Mason rerun while I struggled in agony to bring forth his progeny. I’ve never forgiven Perry Mason. I’ve never tried Totino’s Party Pizza ! I’ll have to see if its in this part of the country ! You should be an advertiser- you do a great job !!! Now, I am hungry for pizza !!!! So we all have our dirty little secrets, our fetish foods, if you will. Glad to know, someone as wise and clever as you, is no exception. Bravo! Enjoy your little pizza and do let us know if we need to ship some out to you! I once dated a “party” pizza. The Walk of Shame the next morning was pretty awful. The worst part about party pizza is that I’m impatient. Yeah, it’s fault, not mine. I always convince myself I’ll be able to resist it’s fully-cooked charms until after it has properly cooled. And I’m always very, very wrong about that. I must have eaten hundreds of Party Pizzas. Cheap, Fast and not particularly healthy (just like I like my women? ), they satisfy! Long live Totinos!